Two years ago, Bank of America made headlines in nearly every major national news outlet when it announced it would “hire more than 1,000 small business bankers.” It’s been using the hirings to gin up a steady stream of positive local press ever since, most recently in Florida, where newspapers reported last month that Bank of America was adding 130 of these special loan officers. But what exactly these “small business bankers” have been doing is anyone’s guess. 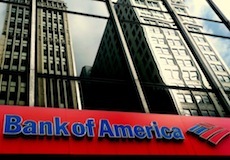 Small business lending at Bank of America has plunged 38 percent since 2009, falling from $34 billion to $25 billion, according to FDIC data. The story is much the same at the other giant banks. Even as they’ve been pushing out marketing messages touting their support of small businesses, big banks, including JP Morgan Chase and Citigroup, have been steadily shrinking their small business portfolios. Overall, the volume of small business lending at the nation’s largest 18 banks has fallen 21 percent since 2009. But the picture is even worse when you consider that these banks have gained market share. 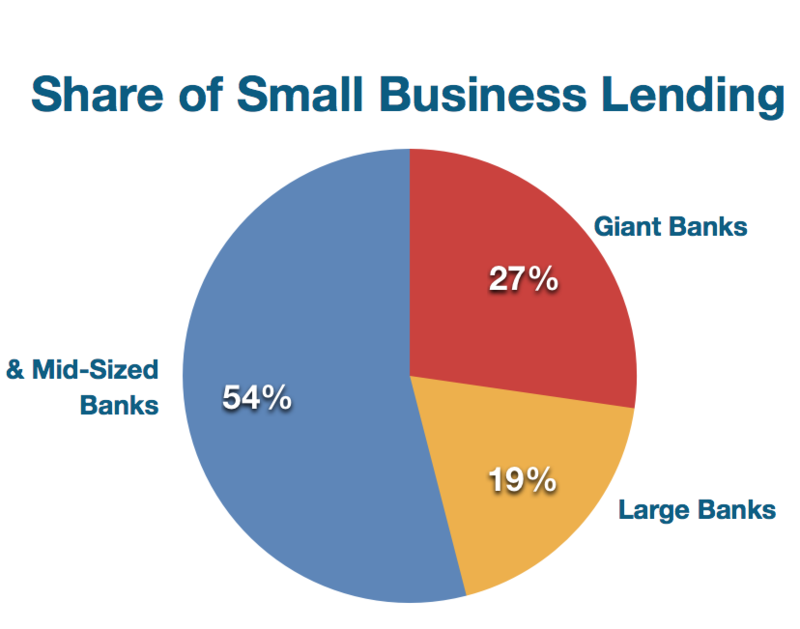 As a share of their assets, small business lending at these banks fell 33 percent. 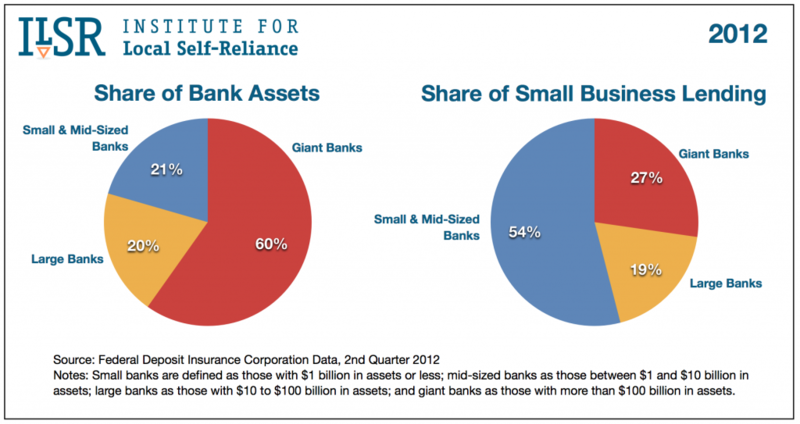 The top banks now control 60 percent of U.S. bank assets, but provide only 27 percent of small business loans. 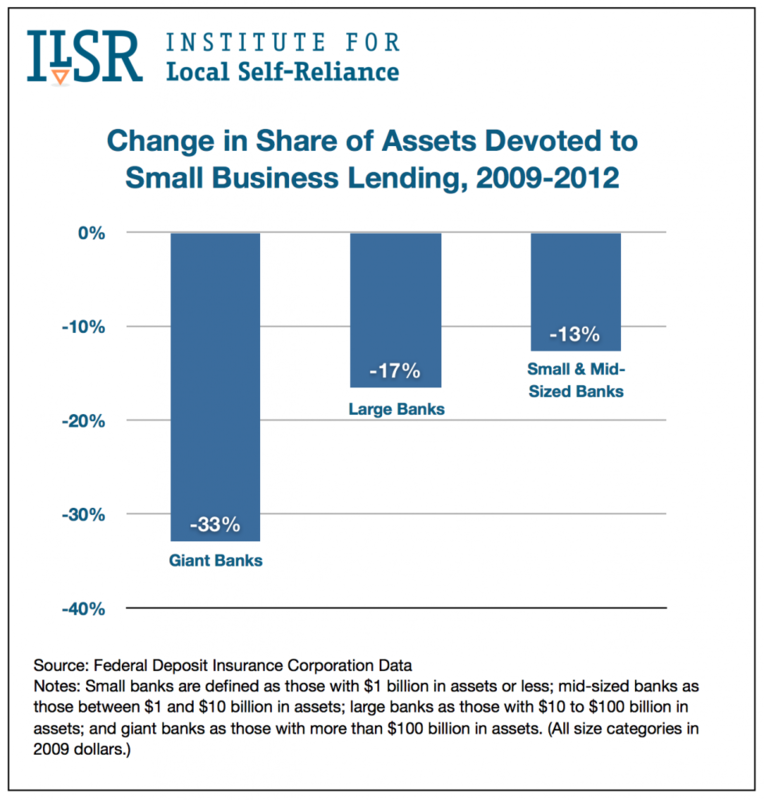 Small business lending has fallen some at small and mid-sized banks, but not nearly as much as it has at big banks. Today, there are 938 fewer small and mid-sized banks than there were three years ago and their share of bank assets has fallen from 23 to 21 percent. Even so, these banks continue to provide 54 percent of small business loans, the same share they held three years ago. All of this adds up to what may be the most compelling argument for breaking up the nation’s biggest banks (by passing Senator Sherrod Brown’s SAFE Banking Act). A critical function of our banking system is financing small businesses and big banks are doing a rotten job of it. Trying to cajole or compel them to do more won’t make much difference because the problem is largely inherent to their scale. They lack the local decision-making and intimate knowledge of local borrowers and local markets that small banks have, which leaves them ill-equipped to make smart judgments about the likelihood that a particular business will succeed or fail. This mismatch between the scale of banks and the needs of the real economy is hurting the recovery. A NYSE survey published in August reported that 47 percent of small businesses have been unable to secure the funds they need and two-thirds are planning either layoffs or no new hiring in 2013. There are long-term consequences too. Studies have found that regions where big banks are especially dominant end up with fewer small businesses and slower job growth over time than areas where small local banks are still vigorous. In a recent survey by George Washington University and Thumbtack.com, 6,000 small business owners were asked an open-ended question: “What policies or programs could the government change or implement that would help your business?” The policy most commonly mentioned by small businesses had nothing to do with taxes or regulation. It was improved access to loans. As actual small businesses struggle, big banks continue to use the idea of small businesses to prop up their own image. A couple of weeks ago, 13 big banks publicly congratulated themselves on reaching the halfway mark in a pledge made last fall to increase small business lending by $20 billion. As Ami Kassar reported in his New York Times blog, the banks achieved this with two audacious sleights of hand. They counted companies with up to $20 million in annual revenue as “small.” And they raised the credit limit on many existing lines of credit, counting these dollars as loan growth even if the borrowers did not actually tap into the extra credit. Perhaps dreaming up PR schemes like this is what all those “small business bankers” at Bank of America spend their days doing. Yes: on the US micro-economic scale this is true. To further substantiate your position on the macro-economic scale, please also read Michael Hudson’s recent comments, as to the QE-3 disposition and the Big-5 US Banks.